Though the variety of the food and its quality are most essential part of restaurant menu, but its template also matters. The best template will attract more food servings on the table of customers for sure and definitely make an ordinary item more attractive. However, for a designer, who designs the menus, sometimes it becomes difficult to differentiate in menus of different customers. Moreover, sometimes giving exciting cover page and inner pages to your menu becomes the need for your restaurant. For such situations, using restaurant menu templates is useful. We are proving some of the top restaurant menu templates that you can use. However, selecting the best and most suited one for you is your task. It is suggested to select the one that matches with your theme and your necessity. Here we have provided you various templates wherein some are even for pubs as well so that you can easily select the one according to your need. Apart from this, there are various other templates and all you have to do is to select the one according to your need. This wine list will show your products to your customers in an artistic an clear way, using colors and symbols for aid the customer to choose which wine will drinks, depending your needs. 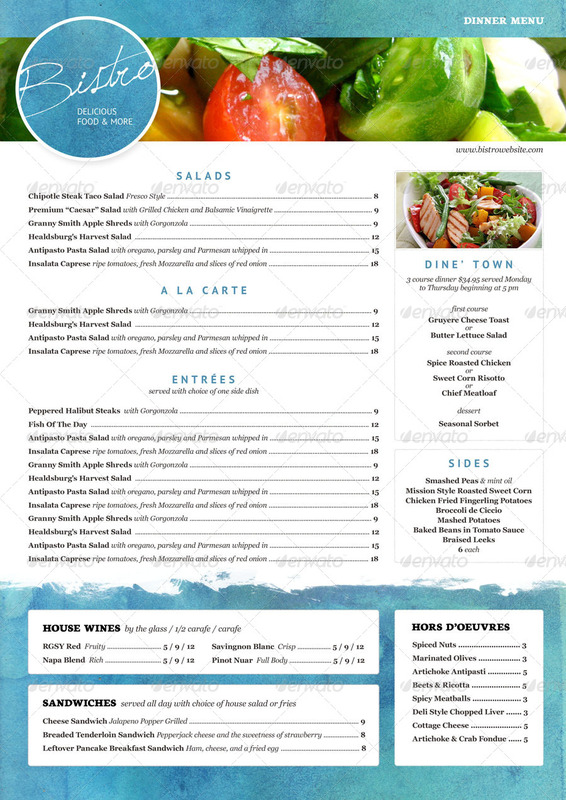 The menu template for a cool restaurant that wants to represent its modern image with this template. Clean, visual, and easy to read, this template is perfect for your business. Just put your logo on the specified area and thats it, new menu image in minutes! This Bistro Food Menu Flyer Template is customized for restaurants that need a unique look. You can change colors and drop your photo in place with ease. Add this to your promotional arsenal for a maximum effect. 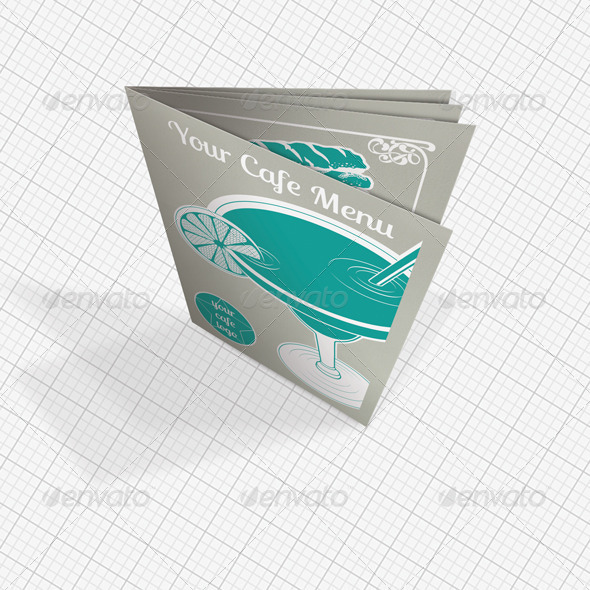 This bistro or restaurant menu design can be used to present almost any kind of food or drinks to your customers. Featured with bold colors and texture, easy to customize. Three layouts for each color scheme. Elegant and clean menu template that fits on many types of restaurants, bars and cafes. Now in Photoshop and Indesign formats!Its highly customizable and tasty design, allows you to adapt to your business being sure to show your products clearly to the client with minimal effort and a very special price. This vector design is done on A4 and can be used as it is or folded to make a table tent menu.Limited to only 2 colors gives a luxury and modern look and feel to every element with its own weight and focus. Above all, it is ready to be printed, laminated, and trimmed for a quick use for your newly open restaurant with just a few easy changes to the list and price. This City Style Menu is designed to suit any kind of city cafes or restaurants.Well-organized and done with modern solutions it would give you assurance that your clients will appreciate your efforts in making their visit unforgettable. This Coffee Shop Menu is what you need for your coffee shop. This menu introduces your client into your coffee shop’s atmosphere.It’s easy to change the fonts and modify the PSD file so you can create unique looks. I’ve also set an image holder for you, to add your own image.The package you download includes 2 PSD files and a Readme text files with the fonts that have been used.Sizes available: 11”×17”(+0.25” bleeds)The PSD files are fully layered and print-ready (300dpi, CMYK ), just edit them and send them to the print company. A 16 full pages modern & high quality menu design for your upmarket restaurant. This suitable for any restaurant business, modern bar, coffee shop, pizza places etc. You can easily edit everything yourself. + Ready to print (3mm bleeds), easy to customize with your images & content. + 16 pages, square size 21cm x 21cm + Flexible for many style restaurant menu + 2 color options + Organized Layers, Paragraph Styles. 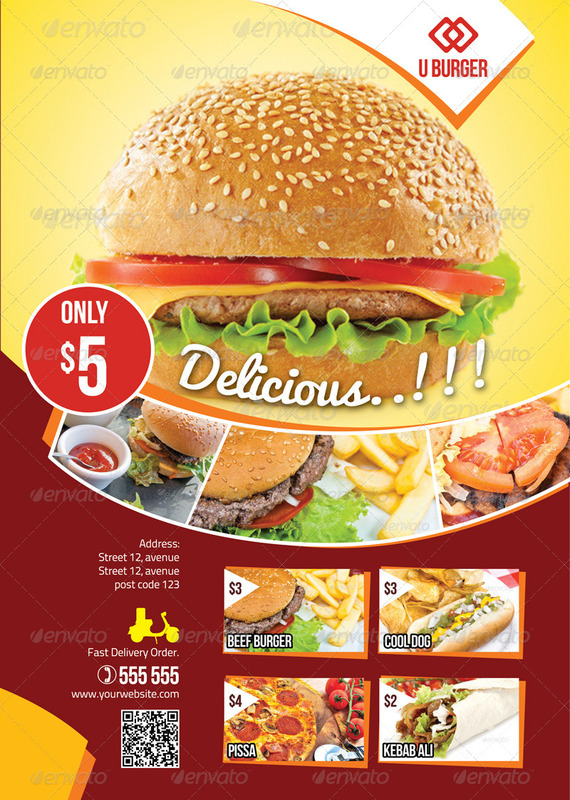 Suitable to any fast food promotions, contain 2 PSD files with full customize-able, smart object, 300 dpi, CMYK ready print and bleed. Create your own menu fast and easy! This 8.5×11 Food Truck Menu Flyer with bleed space is easy to personalize and adding your own information, pictures, and everything else is a piece of cake. Not only you can impress your clients with your food but also with this eye catching design. This template is easily customizable in Adobe Illustrator or Adobe Photoshop. Perfect for bars, restaurants, clubs, coffees, pubs. Create your own list of drinks in 15-30 minutes with using 10 simple templates in more formats. These distinguished set is made to make an impress, professional, clean style and stylish designed. Recommended for Restaurants, catering, gourmet food and all kind of business related to gastronomy. The main file contains 3 editable .PSD files carefully ordered so you can easily customized. Greenish Fast Food Menu is great for Fast Food Restaurant, but it’s also suitable for any other restaurant. 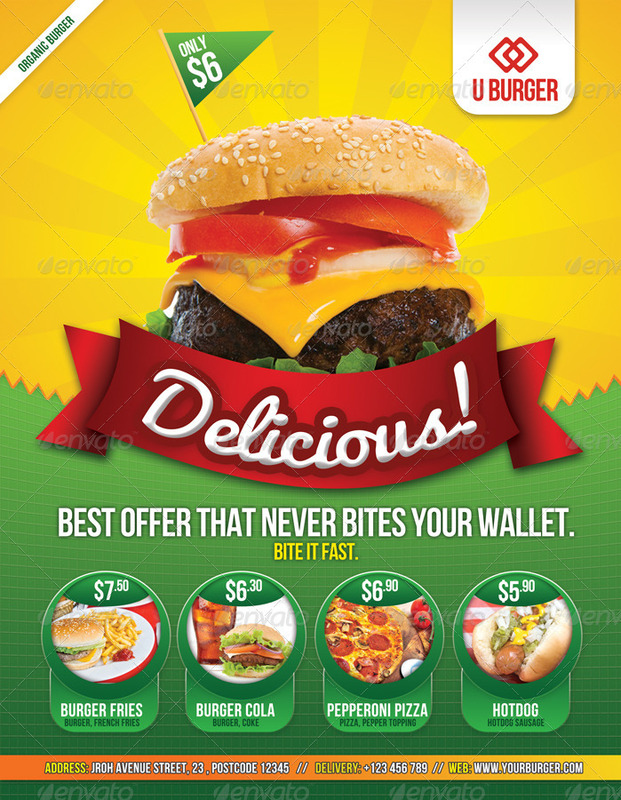 Greenish Fast Food Menu including 2 PSD file (front and back design) which fully layered so you can edit it easily if there any changes. Just click to the group or layer to edit it. “Italian Menu Template vol.2” suitable for any Italian cafe business or related to restaurant business. Italian Restaurant menu. Front and back page and two inner pages but you can create as many as you like. Mexican Menu Template vol.2 suitable for any ethnic cafe business or related to restaurant business. Very easy to personalize; just replace placeholders with your own images, change prices and descriptions. This file is a two-sided design with an elegant design in the front and a well-organized food menu in the back. This file does not include the images. “Monster Chalkboard Menu”, a flexible and easily editable restaurant menu in chalkboard style. Comes with lots of extras including five chalk monsters and other food related shapes which you can just drag and drop into your menu. Great menu template for restaurant and cafe. Consist of Adobe Illustrator (AI) and Vector (EPS) format files that fully editable or resizable. These files are ready to print with CMYK color mode and bleed. A perfect menu design to emphasize your tasty food. Suitable for restaurants, fast food, take out, pizza places etc. These Layouts are suitable for any Ethnic Restaurants. The elegant menu, flyer and the map card compliments each other. The layout can be altered according to the requirements. These distinguished brochure is made to make an impress, professional, clean style and stylish designed. Recommended for Restaurants, sushi places, catering, gourmet food and all kind of business related to gastronomy.The main file contains 3 editable .PSD files carefully ordered so you can easily customized.CMYK in 300 dpi, with crop marks, guides and bleed lines. An elegant and sleek coffee shop or tea room menu. This menu has a Victorian chic style, with a modern twist that oozes quality. This template comes with two different templates; a two panel (single fold) template, and a three panel (two fold) version. Simply choose the menu that suits your needs or printing budget. The template uses only free fonts (or ones pre-installed with Adobe InDesign), and is print ready. Links to the photodune.net (envatos stock photography site) photos used in the preview are provided in the file instructions too. Photos for illustration purposes only. 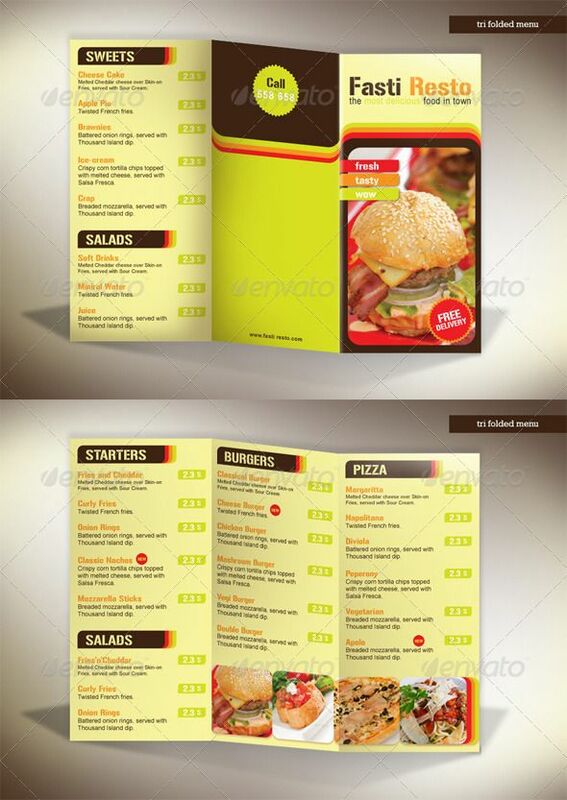 Tri-fold menu template perfect for fast food restaurant, pub or can be used as take away menu. It is fully and easily editable and is very simple to work with and highly customizable to answer your needs. Versatile, elegant and effective letter size menu template. When purchase you obtain the PSD and the INDD templates to edit in the way you want! 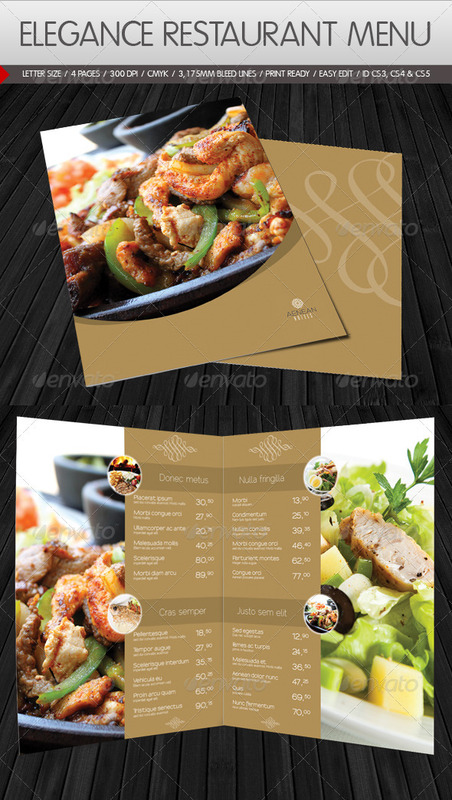 This tri-fold menu card is designed to help restaurant owners to print their menu lists using this fresh looking design. These printed tri-folds also can be distributed for marketing purposes for restaurants. “Italian Menu Template vol.1” suitable for any Italian cafe business or related to restaurant business.Menu has been created using tables and cells for easy update. Backgrounds are created using layers in Photoshop, easy to move or change images if required. Suitable to any fast food promotions, contain 1 PSD files with full customize-able, smart object, 300 dpi, CMYK ready print and bleed.